When I look at written World War II history, I see names, dates, places of great battles, and statistics. I rarely see mention of family, but families are what’s at the core of such a great struggle. One man was not fighting this great war against his enemy, another man. Their families were right there beside them fighting, too. When one man went down, many more at home who shared his blood went down with him. The loss of one man became a great emotional loss at home and the loss of many future generations of his family. Two B-17 flying fortresses collided above Germany on September 28, 1944. Of the eighteen men aboard the two forts, four survived. None of the four live on today, but their children and grandchildren carry on their legacy. At least three of the men who died that day had children or knew that they were to become fathers in the months to come. That makes seven families, not quite half, who share a common history dating back to WWII. Of the eleven men who would have no descendants, most of them had siblings who had children and there are nieces and nephews, and great-nieces and -nephews who also share their history and cherish their memories. We are known collectively as the Buslee and Brodie crews’ NexGens, the Next Generation of the men of these two crews of the 384th Bomb Group of the Mighty Eighth Air Force who bravely defended our country in WWII. I began my search for Buslee/Brodie NexGens, who I consider extended family, in 2011 after I met Wallace Storey. I remember so clearly now my astonishment when Wallace told me that he had been in touch with other family members of the two crews. It was that light-headed feeling of shattered disbelief that almost knocked me off my feet, the thought of something I had never considered possible. There were others out there who knew my father’s story of the mid-air collision. It was no longer my family’s private history. I had never before considered that my sister and I were not the only ones. From my dad’s stories, I knew he was the only survivor of the Buslee crew. At the time, I did not know that children were born to two of the men after the mid-air collision. And I never suspected that any of the men of the Brodie crew had survived the horrific accident, but three of them had. One of their sons had contacted Wallace Storey before me. So had a newphew and great-nephew of Buslee crew members. I began contacting the relatives for whom Wallace provided information and I started researching each man who had been on those two planes, looking for their families, and finding some of them. 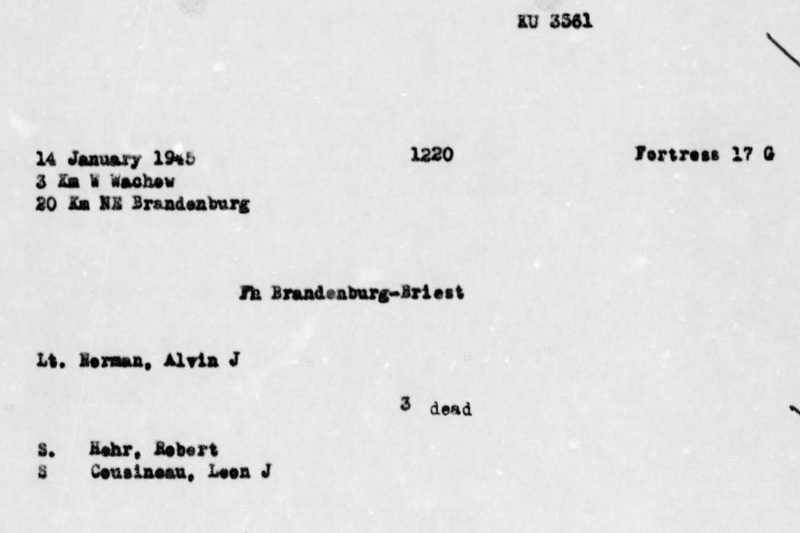 During this process, I realized there was a lot we didn’t know about September 28, 1944, and that the other NexGens wanted to know as badly as I what happened in the skies above Magdeburg, Germany on September 28, 1944. Top secret reports from WWII were public now, and I discovered details bit by bit and started putting them together, like pieces of a puzzle. I shared what I found with the other Buslee/Brodie NexGens and they shared knowledge, photos, and letters. These men who were our fathers and grandfathers, and uncles and great-uncles had an incredibly close bond. And now we NexGens were forming our own bond as we learned details about that late September day, details that in the 1940’s our families struggled so very hard to discover, but of which they were left uniformed. With the power of knowledge of what happened to the boys that day, we are able to feel them again, hold them close, grieve for them, and look at them with a new sense of awe and respect. I have new family now, these descendants of the great airmen of WWII. We live in the lingering shadows of an aluminum overcast that will never fade away as long as we remember. Sometimes we choose our path in life and sometimes it is chosen for us. Every single decision we make and every step we take in a certain direction write a piece of our history. But that history is not solely of our making. Outside influences are a huge factor in what happens to us upon each footfall, upon each spoken and unspoken thought, upon the most minute action we take. The men of the Buslee and Brodie crews all chose the path of joining the United States Army Air Forces to fight in WWII. 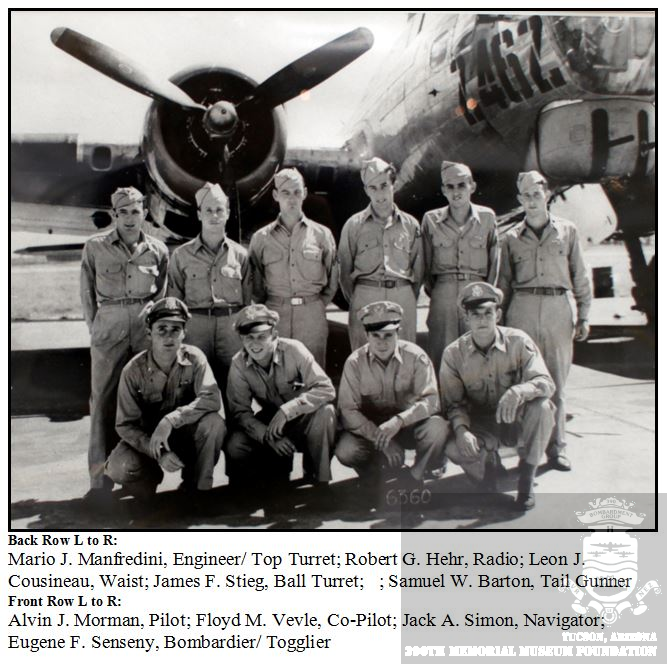 The histories of eighteen men from eighteen families were all very different from the moment of their births until the morning of September 28, 1944 when they climbed aboard their two B-17s to take their places in the 8th Air Force bomber stream on that day’s mission to Magdeburg, Germany. On that day, each man had his job to do. The pilots and co-pilots had to deliver the bombs to the target. The navigators had to direct them to the correct location. The bombardiers had to release the bombs at the precise point. The radio operators had to maintain communications. The engineers had to make sure all systems worked properly. The gunners in the ball turret, waist, and tail had to defend their ships and loads of bombs and personnel. Each man had his individual job, but each crew was speeding through the skies toward their target as one. They had one goal. Get their bombs on the target. And then they could go home. That day, their path was chosen for them. They were not completely in charge of the history they were making that day. They were a small piece of an enormous weapon of destruction, a tiny cog in a very big wheel. And that day, they would not go home. Whatever minute action or outside influence it was, because a single determining factor cannot be pinpointed, the Brodie crew’s ship collided with the Buslee crew’s ship after coming off the target. That one defining action fixed forever the most important moment in the history of eighteen men. It was the moment that the lives of fourteen men were lost and fourteen families were destroyed. It was the moment that the future path of four men was reset to skew greatly from the path that was imagined for them at birth. It was just one moment in history. But it changed everything. More Information About William D. Barnes, Jr. Thank you to Keith Ellefson, combat data specialist and volunteer for http://www.384thbombgroup.com, and Bobby Silliman, of the Carlsbad Army Airfield’s Facebook community, for finding “our” William D. Barnes, Jr. Bobby Silliman has a master list of all 47,466 bombardier graduates who earned their wings in America during WWII and the only William D. Barnes Jr. was from Hastings, Michigan. There were no other bombardiers with this name, so this has got to be our guy. Bombardier class picture of William Douglas Barnes, Jr.
Now that we found the right Barnes, I can tell you more about him. William Douglas Barnes, Jr. was born on May 20, 1919 in Charleston Township, Pennsylvania to Williams D. Sr. (b. August 4, 1884 – d. September 27, 1965), and Carrie M. Vandegrift Barnes (b. November 8, 1887 to d. July 6, 1970). In 1920, the Barnes family lived on a farm on Elk Run Road in Charleston Township, Tioga County, Pennsylvania. William Sr. was a farmer. William Sr. was 35, Carrie was 33, and William Jr. was only 7 months old at the time of the census on January 2 or 3, 1920. In 1940, the family lived in Hastings, Barry County, Michigan at 135 S. Jeff Street. They moved to Hastings some time after 1935. William Sr. was a pattern storage foreman for a press and tool manufacturer. Carrie was no longer working outside the home. William Jr., at 20, was a commercial teller for a city bank. Charles was a clock repairman and salesman for a jewelry store. 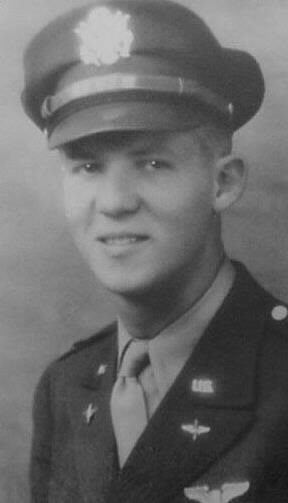 Younger brother Charles was the first of the Barnes boys to enlist in the Army Air Corps on January 10, 1942. 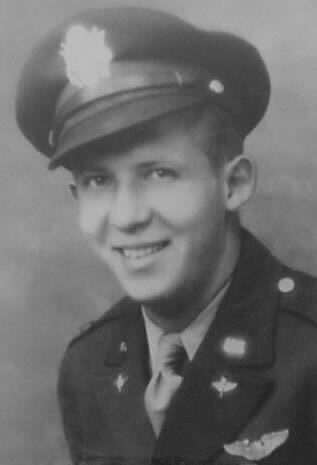 William Jr. enlisted in the Air Corps a few months later, on May 21, 1942. Born only about a year apart, the brothers must have been very close. William D. Barnes, Jr. was assigned to the 384th Bomb Group, 545th Bomb Squad on AAF Station 106 Special Orders #148 dated July 26,1944 as bombardier of the James Joseph Brodie crew. For more information about his military career with the 384th, see my previous post. Charles married Dorothea E. Kolch on October 22, 1950 in Marshall, Calhoun County, Michigan, but I can find no record of a marriage for William Douglas, Jr.
William Douglas Barnes, Jr. died on December 6, 1990. 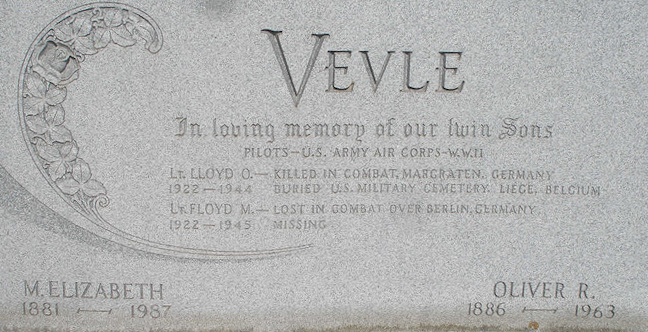 He is buried in Riverside Cemetery in Hastings, Michigan. His parents are also buried in the same cemetery. George Marshall Hawkins, Jr. was born on November 26, 1918 in New York to George Marshall, Sr. and Mildred Sonnenthal Hawkins. George Jr. was their only child. George, Sr. was born on June 16, 1893 in La Plata, Maryland. His parents were also Maryland natives. Mildred was born on December 16, 1898 in Queens, New York. Her parents, William and Clara Sonnenthal, were of Hungarian or German descent and immigrated to the United States in the late 1800’s. Aside from Mildred, they had four other children – Adolph, Elsa (or Elsie), Leah, and Elwood. The 1900 census reported that Mildred’s parents resided in Queens, New York. George Sr. and Mildred lived on Laurel Street in Ridgefield Park, Bergen County, New Jersey in 1920. George Sr. (who may have gone by his middle name “Marshall” as recorded by the census) was twenty-five and Mildred was twenty-one. 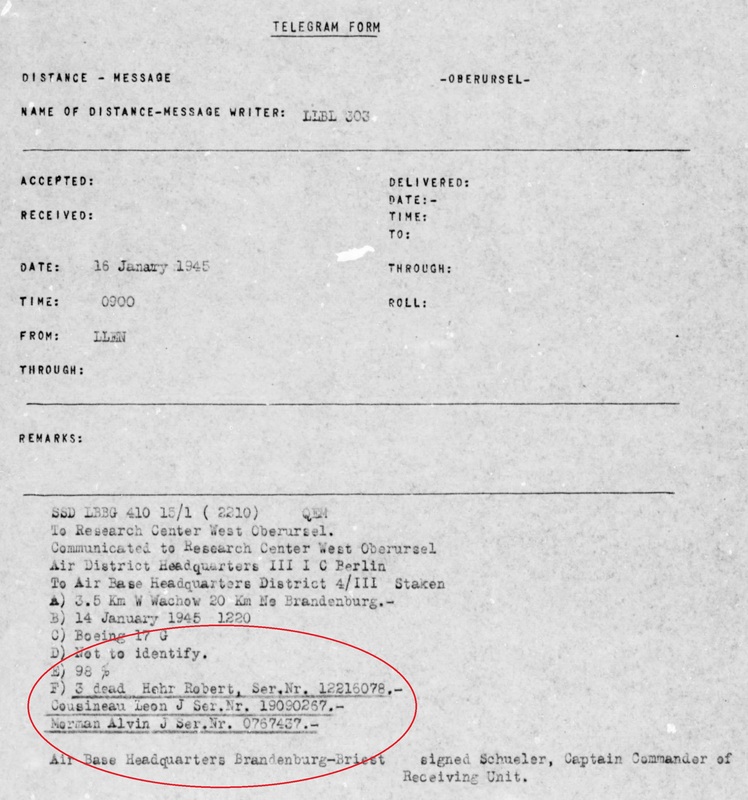 Mildred’s parents were reported to have been born in Vienna (her father) and Hamburg (her mother). George Jr. (who it seems also went by his middle name “Marshall”) was one and a half years old. George Sr.’s occupation was listed as a chemist in the field of medicine. By 1930, the Hawkins family had moved to Woodbridge in Middlesex County, New Jersey, where they lived at 35 William St. George Jr. was now eleven years old. By 1940, the family had moved to 52 Burchard Street in Raritan Township (since renamed to Edison), Middlesex County, New Jersey. George Jr. was now twenty-one and in college. George Sr. was working as a foreman of a chemical factory. (According to George Sr’s WWII draft registration card, he worked at Heyden Chemical Corporation in Fords, New Jersey). On July 17, 1941, George Jr. enlisted in the service in Trenton, New Jersey. According to his enlistment record, he was single, had three years of college, and his civilian occupation was as an actor. After training in the states, he was assigned to the 384th Bomb Group, 545th Bomb Squad on AAF Station 106 Special Orders #148 dated July 26, 1944, as navigator of the James Joseph Brodie crew. He served as navigator on nineteen missions, sixteen of them with the Brodie crew. It is unknown why he flew those three missions on different crews as the Brodie crew did fly those missions, but with a replacement for Hawkins. George Jr. was aboard Lazy Daisy with the Brodie crew on September 28, 1944, when their B-17 collided over Magdeburg, Germany with the Buslee crew’s Lead Banana. George Jr. was one of only three men aboard Lazy Daisy to survive and became a prisoner of war. As an officer, he was not held in Stalag Luft IV with the other two survivors, enlisted men Wilfred Frank Miller (tail gunner), and Harry Liniger (waist gunner). George Jr. was held as a prisoner at Obermassfeld Hospital #1249 (Serves Stalag 9-C), Obermassfeld Thuringia, Germany 50-10. Following “Bombs away” at our target over Magdeburg, Germany, our B17-G and another ship in our formation collided. At the time of the accident our plane was in good condition with nothing more than light flak damage. As far as I know, all men on board were uninjured. At the time of the collision, the front section of our nose was carried away, and with it, the nose gunner, S/Sgt Byron L. Atkins. The plane seemed to be flying straight and level for a very few seconds and then fell off into a spin. I managed to break out of the right side of the nose just behind the right nose gun. Floating downward I saw an opened but empty chute. Leading me to believe that Atkins’ chute was pulled open at the time of the accident or by him later. However, because of the position of the chute I think the chute must have been opened following a free fall of a few thousand feet and then, because of damage or faulty hook-up, failed to save its occupant. Following my own free fall, our ship was circling above me. It was then in a flat spin, burning. It passed me and disappeared into the clouds below. When I next saw the ship it was on the ground. While floating downward, I saw one other chute below me. I landed a mile or so from the town of Erxleben, Germany…west of Magdeburg. The plane landed within two or three miles of me. Many civilians and the military there saw the incident. The following evening I met two members of the crew…the waist gunner, Sgt. Liniger, and the tail gunner, Sgt. Miller. Sgt. Liniger said he was attempting to escape through the waist door when an explosion threw him from the ship. At that time Sgt. Miller said the tail assembly left the ship and he later chuted from the tail section. To the best of my knowledge, All other five members of the crew were at their positions on the plane and failed to leave the ship. All were uninjured up till the time of the collision. In the Casualty Questionnaire section of MACR9366, Hawkins adds that Miller, the tail gunner, rode the tail down some distance following an explosion which severed the tail from the ship. Miller later bailed out of the tail section. Also, in the Casualty Questionnaire section, Wilfred Miller adds that he heard through Hawkins that the wing of the other plane knocked Atkins out the nose without his chute. William D. Barnes, Jr. was assigned to the 384th Bomb Group, 545th Bomb Squad on AAF Station 106 Special Orders #148 dated July 26,1944 as bombardier of the James Joseph Brodie crew. The target of his first mission on August 7, 1944 was a German Luftwaffe fuel depot in Dugny (Paris), France. He flew a total of fifteen missions as a bombardier, the majority of them with the Brodie crew. His last mission as a bombardier was on September 13, 1944. At that time, Barnes retrained as a navigator. He was not flying, as he was still in training, on September 28, 1944 when the Brodie crew’s B-17 Lazy Daisy was involved in the mid-air collision with the Buslee crew’s B-17 Lead Banana. His decision to retrain as a navigator may very well have saved his life. Barnes’s next mission was not until October 17, 1944, when he flew his first mission as a navigator. He flew his last twenty missions as a navigator, completing his thirty-five missions on December 28, 1944, earning him a ticket home. His decision to extend his service by the month he spent in training allowed him to survive WWII, complete his tour, and return home. 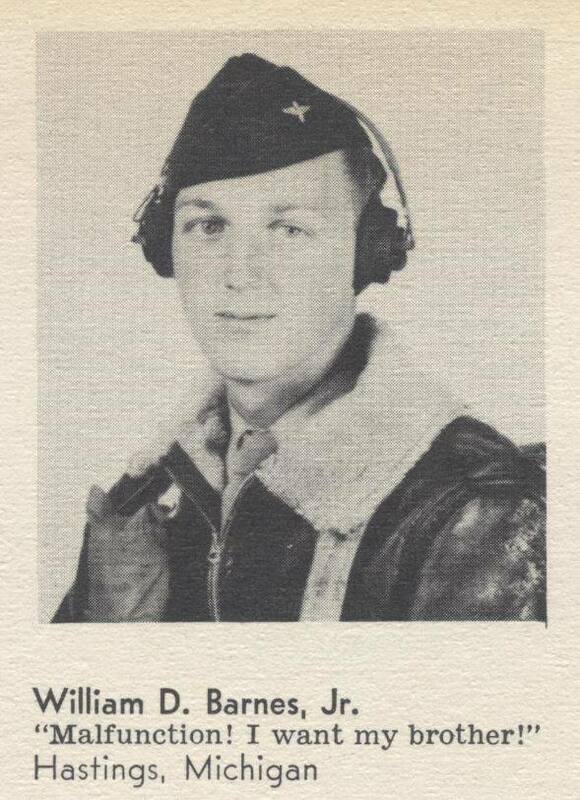 To view the personnel record of William D. Barnes, Jr. on the 384th Bomb Group’s website, click here. Note: Barnes’s replacement, Byron Laverne Atkins, as togglier of the Brodie crew on September 28, 1944, did not survive the mid-air collision. One day a Navy veteran named Michael Newberry, who does volunteer work for the Van Zandt County Veterans Memorial in Canton, Texas as the gift shop/museum manager, came across a collection in one of the museum’s display cases that was not particularly visible. It was comprised of some photos, flat boxes, certificates and a folded 48-star American flag. Upon further examination, Mike found the medals, air crew wings, pictures, high school diploma, and aircraft mechanic certification of Staff Sergeant Robert Doyle Crumpton of the 384th Bomb Group’s Brodie Crew. Robert was the top turret gunner/engineer for the Brodie crew and was aboard Lazy Daisy on September 28, 1944 and died in the mid-air collision with Lead Banana. Robert’s half-brother, Claude, had kept the items all of his life and upon his death, Claude’s wife donated them to the museum. Mike set up a nice exhibit of Robert’s items in the museum. He even intends to replicate a model of the Lazy Daisy, the B-17 on which Robert lost his life, to add to the collection. I would like to thank Mike Newberry for honoring Robert Doyle Crumpton with this wonderful exhibit. 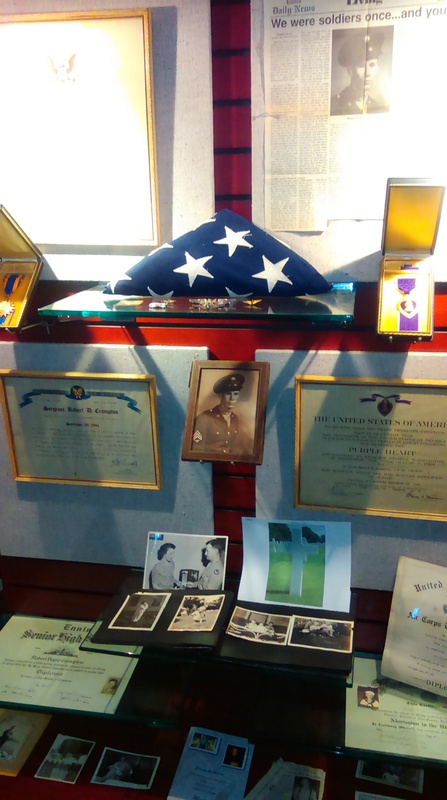 For anyone in the area near Canton, Texas, please stop by the Van Zandt County Veterans Memorial museum to see it. In addition to the Robert Doyle Crumpton exhibit, you can tour the memorial plaza with an Air Force F-4 Phantom, a Huey helicopter, a 105mm howitzer and more. And please tell Mike I sent you! Robert Doyle Crumpton, Jr. was born in 1921 (or possibly as early as 1920) in Ennis, Ellis County, Texas to Robert Doyle Crumpton, Sr. and Stella M. Brown Crumpton. Robert Doyle Crumpton, Sr. was born April 7, 1892. In 1917, he registered for the WWI draft. He enlisted on May 26, 1918. He was a private in the 26th Company, 7th Bn., 165th Depot Brigade, Btry C, 126 F.A. (SN 1 416 038). He was discharged on January 22, 1919. In 1920, Robert Sr. (26 years old) and Stella (23 years old) lived with Stella’s parents, William and Minnie Bachoffer Brown in Ennis, Texas. Stella’s father, William, was a conductor. At the time, Robert Sr. worked as a mail carrier. Robert Sr. died on April 24, 1921 and is buried in Myrtle Cemetery in Ennis. Without an exact birth date for Robert Jr., it is unclear whether he was born before or after his father died. A cause of death for his father is also unknown. After Robert Sr.’s death, Stella married Claude Parks. Stella and Claude had a son, Claude Edward Parks, born August 6, 1930, Robert Jr.’s half-brother. The 1930 census shows Robert Jr. listed as Robert Parks. 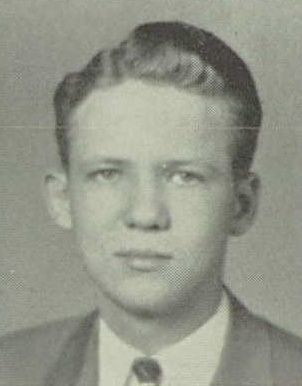 After graduation from Ennis High School, he worked as an automobile serviceman for a time. The 1940 census shows him listed as Robert Crumpton. He was a farm laborer in 1940, an unpaid family worker. 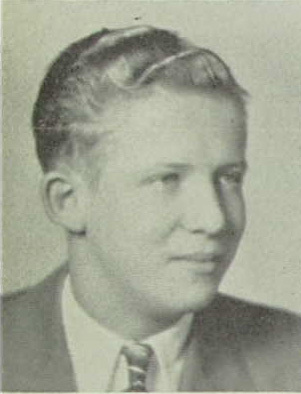 The family lived in Ennis in the 1930’s and 1940’s, where Robert Jr. was born and raised. On May 2, 1941, Robert Doyle Crumpton, Jr. enlisted in the Army Air Forces in WWII at Fort MacArthur, San Pedro, California. He trained in Oklahoma, Arizona, Nebraska, California, and Illinois. Robert served in WWII as the top turret gunner/engineer for the James Joseph Brodie crew of the 545th Bomb Squad of the 384th Bomb Group of the 8th Air Force in Grafton Underwood, England. 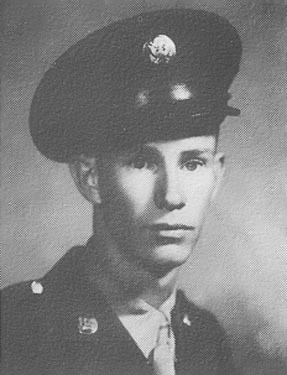 On his nineteenth mission on September 28, 1944, he was killed when the B-17 he was in collided with another B-17 after coming off the target at Magdeburg, Germany. He probably saw the near miss with the Gross crew right above his head from his viewpoint in the top turret (see Wallace Storey’s account of the near-miss), and probably saw the collision with the Buslee crew’s B-17 coming, but was helpless to do anything about it. S/Sgt Robert D. Crumpton earned the Purple Heart and Air Medal with 2 oak leaf clusters. 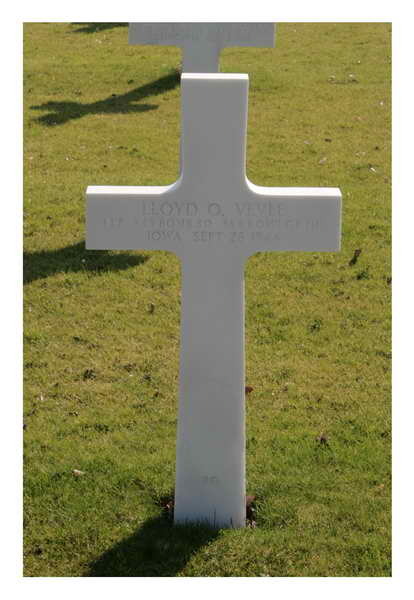 He was buried at the Temporary American Military Cemetery Margraten, Netherlands, Block Plot R, Row 9, Grave 210 before being moved to his final resting place in Plot E, Row 19, Grave 22 of the American War Cemetery at Margraten. Next week: An exhibit featuring the life and military career of Robert Doyle Crumpton at the Van Zandt County Veterans Memorial in Canton, Texas.